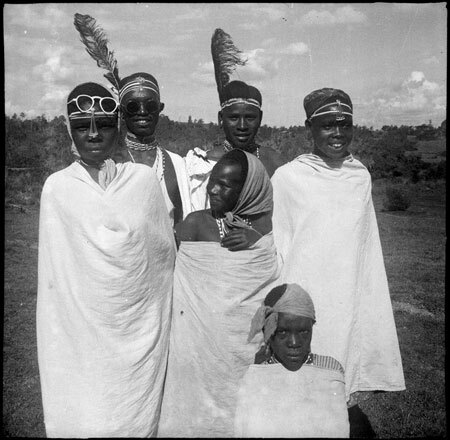 A posed group of six standing youths wearing white body cloths, bead ornaments across their foreheads and feather plumes. One youth is wearing sunglasses and the girl in front of him is wearing the frames of a pair on her forehead as an ornament. This group seem to be associated with a mission or other colonial establishment, the brick building of which can be seen behind them in another image. Morton, Chris. "" Southern Sudan Project (in development). 03 Jan. 2006. Pitt Rivers Museum. <http://southernsudan.prm.ox.ac.uk/details/1998.97.552/>.